I Like You Messages for Him: Feeling nervous about confessing your crush on a guy? If you are a shy girl and want to be subtle about the whole thing, start flirting by sending cute text messages. If you don’t have any issues with being open, write a sweet note on a handmade card and give it to him in person. Take inspiration from this post to ask your crush out on a date in the sweetest possible way. Don’t be afraid to express your feelings. Don’t be stuck in the friend zone forever. Guys love girls who know what they want. And if a date with your crush is on your mind, maybe it is time you bare your heart. 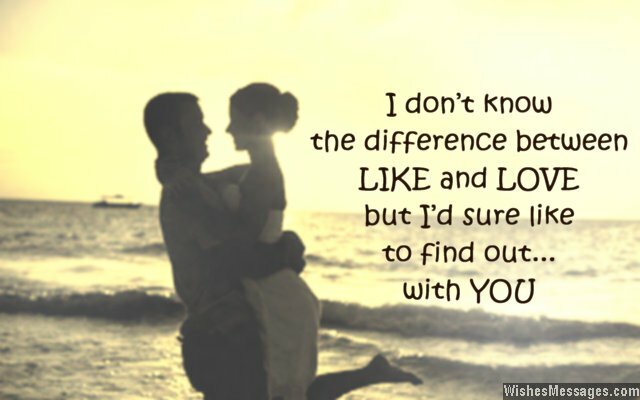 1) I don’t know the difference between LIKE and LOVE but I’d sure like to find out, with you. 2) My tummy starts to rumble and my body language begins to fumble, my eyes start to flutter and my speech suddenly stutters. These are the side effects I get when I see you, because looking at a handsome guy like you makes me go whew! 4) I have fallen ill with a disease which is making me crush on you. I just hope it is contagious so that you have a crush on me too. I like you. 5) You are much more than just dreamy… you are intoxicating. I like you. 6) My selfies are dull and boring. They are missing a spark called… YOU. I like you. 7) A sparkle in my eyes and a skip in my heartbeats, a smile on my face and twitchy toes on my feet. All this and a lot more is what I go through, when I think about how much I like you. 9) Astronauts are not the only folks in the world who have been to the moon and back. I go over the moon every time I see you… I like you. 10) This encrypted message is for the handsomest boy I’ve ever seen… UOY EKIL I. 11) Life had a specific purpose in introducing you to me. Can we spend more time together so that I can figure out what that purpose is? I like you. 12) I wish that real life was like Facebook so that I could just click a button to tell you that I like you. 13) I can go on pretending that I am just your friend, but that’s not how I want our fate to end. I want you to hold me close and hug me tightly, I want you to whisper sweet nothings in my ears softly. I want you to charm me night and day… I like you too, is what I want you to say. 14) I can’t pinpoint if it is your adorable messy hair, cute eyes or your handsome smile – but one of these is keeping me awake at night. I like you boy. 15) Just like how a princess kisses the frog to turn him into a charming prince, I kiss my pillow every night before I sleep, hoping that it will turn into you. I like you. 16) Thinking about you doesn’t give me reasons to smile. But it makes me smile without any reason. I like you. 17) I need to go to bed now because I have a romantic candlelight dinner date with you in my dreams. Will you come? Good night. 18) I always wanted a tall, dark and handsome guy to come and sweep my off my feet. But I wouldn’t mind if he was someone exactly like you either. I like you. 19) This is to let you know that I don’t overuse makeup. It’s just that I blush a lot when I’m with you. 20) I don’t know if this is a crush. I don’t know if this is attraction. I don’t know if this is an impulsive reaction to how handsome you are. But what I do know is that I can find out what this is… only if we can go on a date. 21) Don’t you have dreams of your own? Stop harassing me by coming into my dreams every night. I like you. 22) At first I was smitten, when I saw you. Then I was excited, when I kept thinking about you. But now I am nervous, as I confess that I like you. 23) Your dreamy eyes are the only drug I want to get high on. I like you. 24) Since the day I met you, I have been smiling and laughing without any reason. Ever since our eyes met, my life has been stuck in a blissfully summery season. I like you. 25) How cool would it be if the day was made of 48 hours instead of 24. Then I would get so much more time to daydream about you. I like you. 26) During the day, I see you around in class. At night, I see you in my dreams. But still… I can’t get enough of you. I like you. 27) After I met you, I have found a few new hobbies which include doodling your name, staring at the ceiling and gazing aimlessly at the night sky. In short, I like you. 28) The drafts folder in my email account is full of emails I wrote for you but never had the courage to send. That’s because I am crushing on you. 29) First you came into my school. Then you came into my class. And now you have come into my heart. You are sneaky, and I like you. 30) If my eyes were a camera, I would be clicking photos of you every second. I like you boy. 31) I don’t want your high fives, I want your hugs. I don’t want your fist bumps, I want your kisses. I don’t want your friendship… I want much more. I like you. 32) Every beep on my cell phone excites me because I think you may have sent me a text. Every ping on my messenger gets me worked up because I think you have left a message. And every smile you flash to me raises my hopes because I think that you have started liking me. I like you. 34) If God granted me a wish, I would ask Him to make all the pretty girls in this world disappear so that you have eyes for me and only me. I like you. 35) I don’t want to be your best friend, I don’t want to be your friend with benefits and nor do I want to be in the friend zone with you. I want to be your crush… just like you are mine. I like you. 36) If there was a degree in daydreaming, I would be a doctorate by now because I daydream about you all the time. I like you. 37) Until now, I lived simple life without any problems. But now, my life has become complicated and full of problems. All thanks to my crush on you. Will you please do something about it? 38) I would give up a date with any of the One Direction boys for a date with you. That is how badly I am crushing on you. I like you. 39) I am suffering from short breath, sweaty palms and twitchy fingers… but I haven’t fallen sick. I just have a crush on you. 40) We are just friends but I want much more. I want to give my heart to you and I want you to be mine. I want to be able to hug you and cuddle with you endlessly. I want to just be myself when you are around. I want to lean on you and run my fingers through your hair. I want to close my eyes and kiss you on the lips. 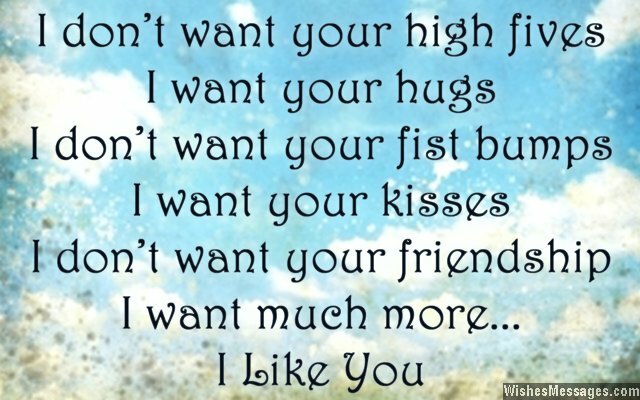 I want you… I like you.